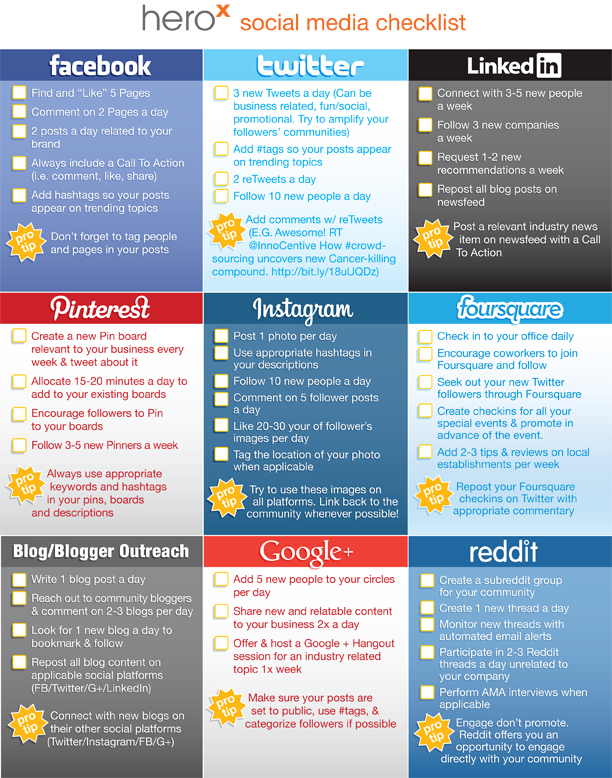 Social Media Check list by heroX – the world’s problem-solving platform. Online Marketing – when it comes to running your business, it is very important to utilize an effective marketing team and practice in order to make sure that is is always running smoothly and that you are able to bring in the most possible clients. One of the very best options available to you is social media, especially in the form of Facebook. Facebook is more than just a media website designed to help share images of people’s lunch and cat videos, as it is actually an effective way to communicate with your customers and connect with them on a daily basis. There are very few other options available to you when it comes to this form of marketing, which is why you need to take advantage of it. Facebook pages can directly effect your business marketing, so you just need to know what it is able to do and how it is going to affect your business. When you create a Facebook page for your company, the page is able to post updates and provide new information to customers. However, one of the major mistakes companies make is the fact that they do not actually look into updating their page on a regular basis. Just because someone follows you does not mean they are going to regularly check your page. You need to provide information in order to make sure they are always receiving the very best possible information on your page. By posting regularly to your Facebook page, you are always appearing on your follower’s news feed. This basically works as free advertising for your Facebook page and company in general. All of this is very important to the growth of your business and your marketing platform. When creating advertisements for a business, many companies spend the majority of their money on traditional forms of marketing, which includes print and television ads. These are fine to utilize, but ultimately, it is not the very best option available. With these different kinds of advertisements, you basically are just hoping your key demographic actually sees it. Most television shows, newspapers and magazines have a basic demographic, but it covers many different smaller demographics you might be interested in. This means you are ultimately paying money to have your ad played in front of individuals who likely are not going to be interested in your product. However, your Facebook page, connected with Facebook advertising, can directly affect and improve your ability to reach individuals who you specifically want to locate. This key demographic can not only be individuals who fall into a specific age range and gender, but also who already have specific likes on their own page as well. This way, you know they are more likely going to be interested in your products or services located on your Facebook page. This makes it far easier to reach possible new customers and clients through marketing on your Facebook page. With your Facebook’s page, you receive statistics and information regarding who is visiting your page and where they are coming from. With most other forms of advertisements you really don’t know what is going to be the most beneficial or where people are coming from. This makes it difficult to know where to target or who to go after with future marketing campaigns. However, with the information you receive from your Facebook page, you can see exactly where these individuals are coming from, what they are looking at and how your page has grown over a set period of time. All of this information is very important when running a business, which is why you need to use a Facebook page to all of its ability. After all, it is a helpful took in your marketing campaign and it does not cost much money at all to set up and to advertise for. This might only be a fraction of your advertisement budget, but it ultimately can provide you with a larger bank for the buck. 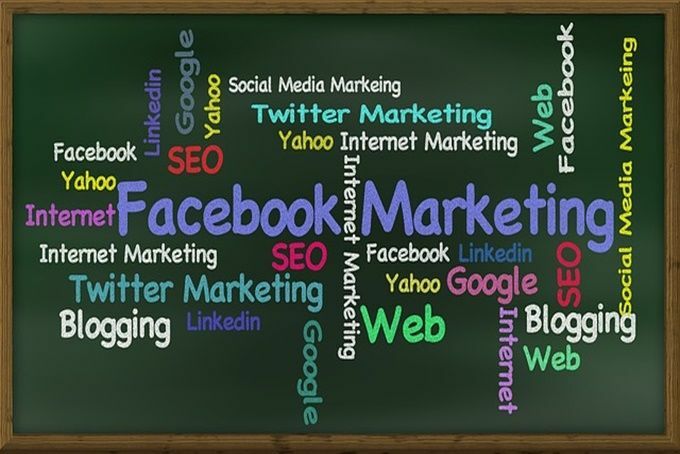 Online Marketing for your business is very important, and while there are dozens of options available to you, one of the best out there is a Facebook page and how it brings in possible customers. Are you using Facebook to get new leads? Let us know what success, results and challenges you’ve had. We have been using Facebook Marketing since it first rolled out. There are some pain points for sure, however overall for the value and revenue increased both in our own business and our clients in the long run, we are sticking to Facebook as one avenue to market. Looking to get better results in your online marketing? We want to know more about your business and discuss how we can help. Talk to us today.